Welcome to the sixth edition of the ArenaCast Mini Reviews. This time Damien listened to the LP of the Australasian indie rockers Teak; singles of the UK, London based alternative rockers Sleeper Effect as well as singles by Toronto, Canada based synth pop trio Great Deal of Noise. 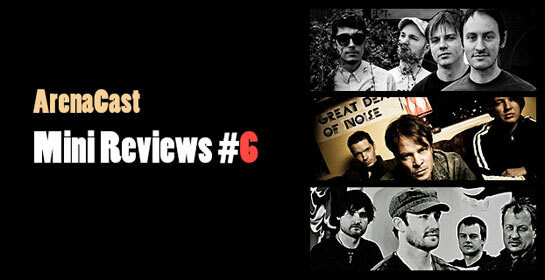 So, have a closer look at our current guests, and enjoy reading the mini reviews! Indie pop\rock four piece group originating from Melbourne, VIC, AU, keenly released their impressive self-titled album on the 25 July 2012, closely followed up with the “After Dark – Remixes” by Martin Kennedy in Aug 2012. Smashing open the LP, the first track “This Time” bounces out with crunchy guitar riffs backed by their dynamic and solid rhythm section carefully blended with stylish and well-arranged vocal harmonies. Lyrically captivating an emotional rollercoaster ride of passion, loss and love while musically exposing a balanced flair of light and darkness, the tracks are supported by stout harmonies and dynamic melodies from “Steve Draper” and “Aaron Ninness”, who both share responsibilities of vocals & guitars. Although the track-list chiefly shadows the introductory indie/rock theme, they have comfortably blended lighter and more elegant songs throughout the album which agreeably plants the finishing touches to the sentiment of the material. Check out and purchase the Teak`s self titled LP and the “After Dark – Remixes” LP from their Bandcamp page. Sleeper Effect — Singles "Fortress" and "Hero Clone"
Hailing from the alternative/metal scene in London, UK, unsigned progressive/metal four piece known as “Sleeper Effect “, set loose their two forceful singles "Hero Clone" in November 2011, and "Fortress" September 2012. Commanding authoritative vocal attitude from the entrance, “Adam Ayadi” bursts dynamically onto the canvas expressing stirring tales that mindfully evaluate social destruction, and problematic toil of our forefathers being shattered and woefully squandered by the present-day structure and methodology of governance, motivating a song of regret for a generation that demands the listener’s attention, appealing to the ever present feeling of mistakes of the past and the hope for a future... if such a thing exist. Supported by their heavy-duty shotgun guitar licks and ballistic bodyguard back-line, the singles get-up-and-go brashness and insightful writing style will happily find admiration with a swarm of alternative metal followers. Listen to and purchase Sleeper Effect`s singles "Fortress" and "Hero Clone" on band Bandcamp page. Great Deal of Noise — singles "Below", "Never Miss" and "Love Is Just A Sound"
Synth/pop-New Wave-Electronic trio from Montreal, Canada released their effervescent singles "Below" and "Love Is Just A Sound" during November in 2011, and followed up with the electrifying track "Never Miss" in Jun 2012. Razor sharp synthesizer sounds and bubbly deep bass tones, resonate and reverberate throughout the compositions, while “Denton Rock” special delivery of entertaining no strings attached lyrics and third person guise on life, communicating the defiance of never settling for second best and the exposed pretentiousness of manipulative individuals. Dance track "Never Miss" grounds a familiar taste of your latest local nightclub hit, with a robust flavour of jealousy and optimism wrapped in generous helpings of the bands original creative style and feel, and as the track enthusiastically jumps out at you, it almost forces you to the dance floor with an almost Cheshire cat like grin.